Gaines Crowned King of the Midwest Again! Mitchell, Indiana’s Dickie Gaines won the King of the Midwest Kelsey Chevrolet Feature for the second consecutive year. It was his third career win at Lawrenceburg Speedway. Dallas Hewitt driving the Todd Keen #18 appeared to be the car to beat for most of the 25 lap A main. He got around Gaines early on and set the pace as the race leader. Gaines meanwhile was working the bottom of the track in turns 1 and 2 and it was allowing him to keep Hewitt close and reel in Hewitt slowly as the laps wound down. With 2 to go Gaines saw an opening and was able to grab the lead from Hewitt on the inside. He would lead the final 2 laps and be crowned King of The Midwest for the second year in a row. Hewitt’s bid for his first career victory at Lawrenceburg was not to be. Hewitt ran second followed by Thomas Meseraull driving the Hoffman 69OT, Garrett Abrams and Matt Westfall. Heat race winners were Westfall, Meseraull, and Hewitt. Nick Bilbee won the B main. In all 26 Kelsey Chevrolet Sprint Cars were on hand to compete to be crowned King. 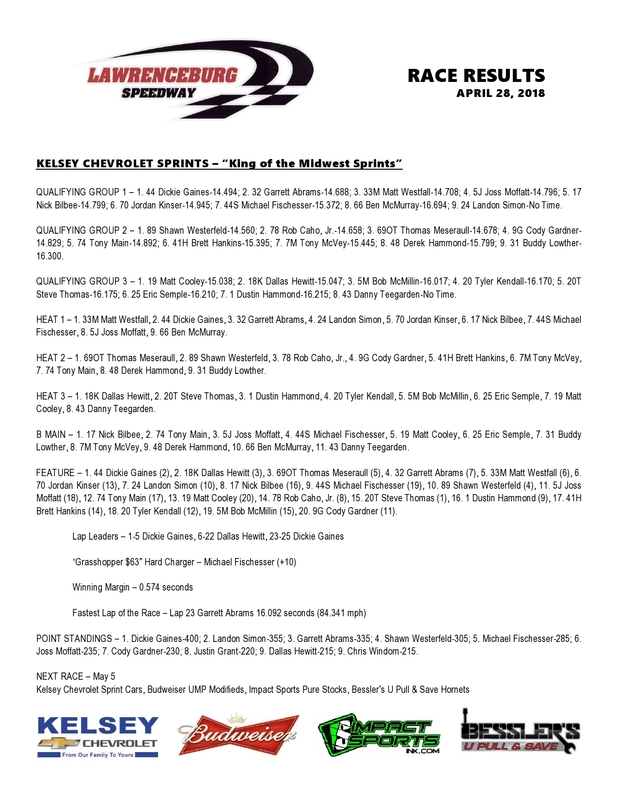 The Kelsey Chevrolet Sprint Cars return to Lawrenceburg on Saturday May 5th. Matt Hamilton may be the hottest UMP Modified driver In southeast Indiana right now. He led all 20 laps Saturday night on his way to his second straight Budweiser UMP Modified feature win. This combined with a feature win Friday night at Route 44 Speedway would confirm he is on a hot streak. He wheeled his brand new Diamond Race Car around the 3/8 mile Lawrenceburg Speedway with precision and often times looking like his modified was in a class of its own. Scotty Kincaid was able to be the best of the rest and finish second followed by Kyle Schnornick, Defending track champ David Spille and Aaron Branham. Heat race winners were Kincaid and Brad Wieck. 16 Budweiser UMP Modifieds made up the field. 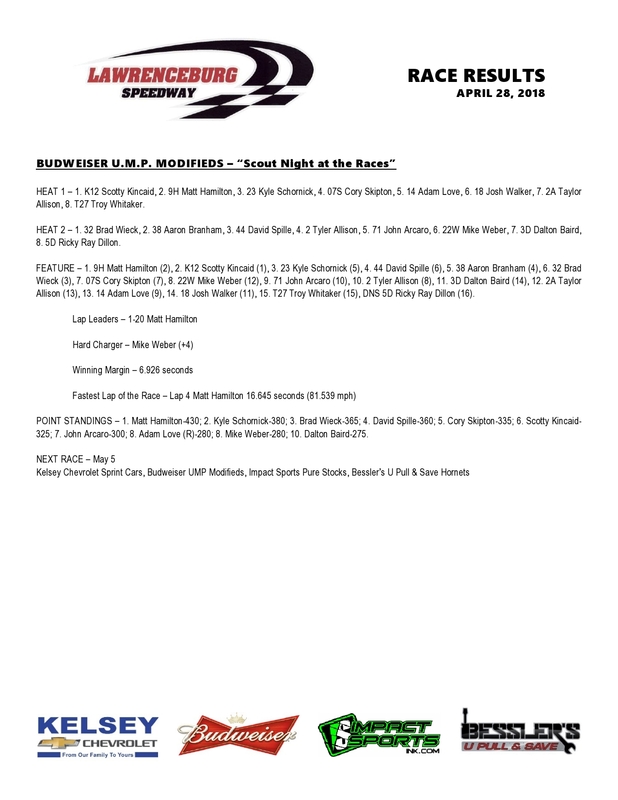 The Modifieds return to the Burg on Saturday May 5th. Champ Moore Wins Hornet Feature! 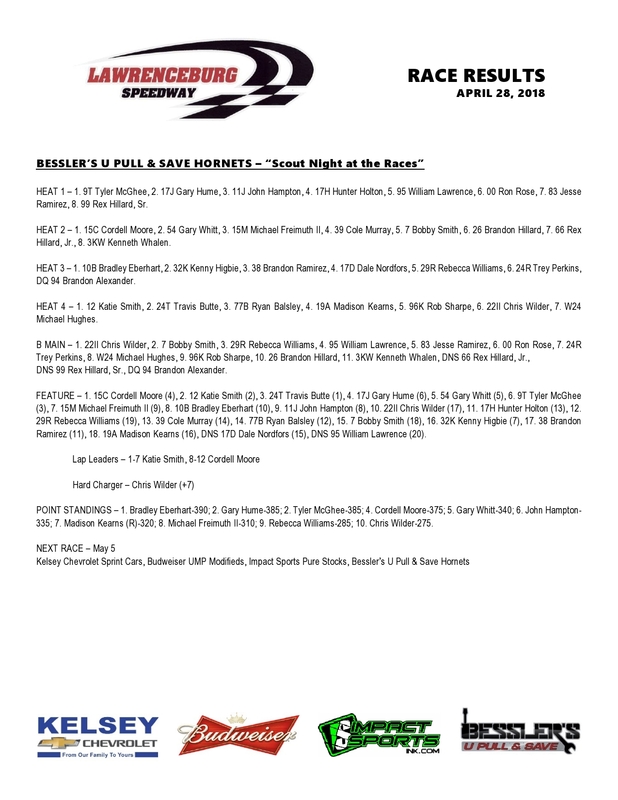 30 Bessler’s U Pull N Save Hornets were on hand Saturday night at Lawrenceburg Speedway. At the checkered flag, Defending track champion, Cordell Moore was in victory lane. If it wasn’t for a faulty ignition in week 1 , he would have won for the second straight week, but on this night it was a no doubter. Moore was clearly the car to beat and no one else had anything to compete with the champ. The rest of the top 5 was Katie Smith, Travis Butte, Gary Hume and Gary Whitt. Heat race winners were Tyler McGhee, Cordell Moore, Bradley Eberhart, and Katie Smith. Chris Wilder won the B Main. The Besslers U Pull N Save Hornets return to Lawrenceburg on Saturday May 5th. Will McRoberts Back in Victory Lane! The winningest driver in Impact Sports Purestocks history at Lawrenceburg won Saturday nights feature at the 3/8-mile-high banked Speedway. Will McRoberts fended off a challenge from his son Corebin early on but pulled away in the late stages to secure his 18th career win. Corebin McRoberts finished second followed by defending track champ Don Grace, Steve King and Danny Eichler. 13 Impact Sports Purestocks were entered for the nights events. The Impact Sports Purestocks return to Lawrenceburg on Saturday May 5th.